Celebrate Spring with our Annual Easter Brunch Extravaganza! MacDonald Island Park invites you to join us in the Grand Ballroom at Shell Place for a deluxe Easter Brunch buffet. Served under the direction of Executive Chef Sudhir D'Souza, the buffet includes something for everyone, featuring diverse breakfast fare, salads, entrées, omelet station, carving station, desserts, and a children’s buffet. In addition to brunch, take part in the search for hidden treats left behind by the Easter Bunny! The annual Easter Egg hunt will take place in the Turf Field House at Shell Place. 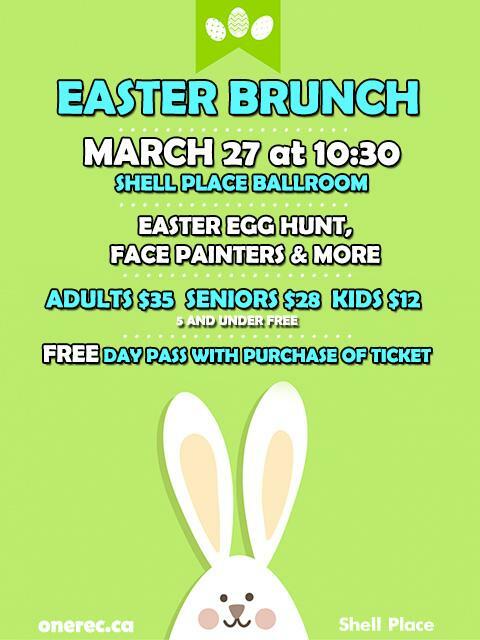 Easter Brunch ticket holders receive a complimentary day pass to the Suncor Community Leisure Centre for Easter Sunday. A day pass includes access to the Syncrude Aquatic Centre and Climbing Wall, among other facilities.